February TRC Project Contest Winners! In case you’re new to the Trossen Robotics Community, here’s a quick refresher on how this contest works: First, all kinds of fantastically talented and dedicated people come to our Project Showcase forum to tell us all about the projects they’ve been working on. Periodically, we (the Trossen Robotics team) sort through these projects, and score them very scientifically in the following categories: "Wow" factor, Ingenuity, creativity, and presentation (this includes graphics, videos, documentation, explanation, etc.). This is the fourth contest we’ve run here at Trossen Robotics, and the projects just keep getting cooler! This time around, we extended the deadline and upped the stakes. Since the last contest, the community has grown and expanded well beyond our expectations, and this has resulted in some of the best work we’ve seen yet. If you showed off your project in our Project Showcase forum, give yourself a big ol’ pat on the back. Now, let’s get to the meat and potatoes. Here are the runners-up and winners, in suspense-building ascending order! We’ve been working a little too closely with Andrew to let him enter the contest, but we can’t totally leave him hanging. He’s been building a "Johnny 5"-inspired humanoid/trackbot hybrid, and it’s really coming together. His brain (Johnny’s, not Andrew’s) is a Pico-ITX running Windows XP Pro. It has a vocal synthesizer, great big grippers, a reinforced suspension system, a snarky personality, and I’ve heard that it drives around harassing Andrew’s baby. It’s the embodiment of robotic awesomeness, in other words. Check out his thread, picture gallery, and his blog. The Leviskate is a "self-balancing motorboard." Kind of like a Segway for people who really like head injuries. Seriously though, this contraption is truly awesome. There are some cool videos in Rodger’s thread, too. Our favorite thing about the videos is that Rodger sounds genuinely amazed that it actually works. It walks, it talks, it scares the kids. It’s… the Bratinator. Built around the Lynxmotion Brat biped, this monstrosity features speech, binaural hearing, a custom-machined aluminum head. It really pains us to see Gepetto in the runners up, instead of placing in a cash-winning position, but sometimes that’s just the way it goes. This was a very close race. 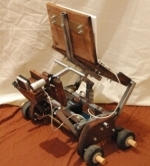 This bot is beautifully made from wood and metal, has a really cool suspension system, carries its laptop brain around with it, and is programmed with some really interesting behavior/mood software. That’s really just the tip of the iceberg, so you’ll have to read through the thread to see Gepetto’s full story. 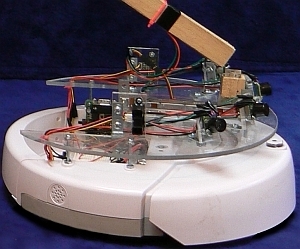 The eyeRobot is a robotic guide for people with vision impairments. It has a whole slew of IR and ultrasonic range sensors for collision avoidance, and pathfinding software to keep it moving through the clearest area. This was a proof-of-concept prototype meant to "marry the simplicity of the traditional white cane with the instincts of a seeing-eye dog." This project is going places, and hopefully one day it will help other people go places. 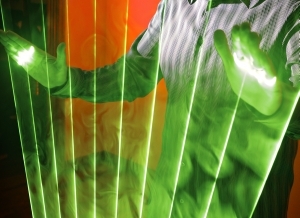 Twenty-two years ago, he saw Jean-Michel Jarre play a laser harp at a concert, and from that day he’s been on a mission. This mission finally came to fruition last month, when he completed his own laser harp, and let me tell you, it’s a pretty stunning piece of equipment. Using a galvanometer to very rapidly and precisely aim a pulsing laser, light sensors to detect where a beam has been interrupted, and an Arduino brain; the harp sends MIDI control signals to a synthesizer. 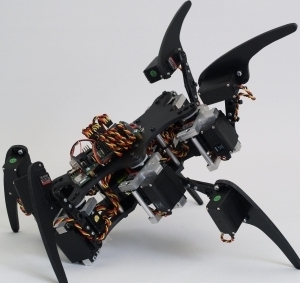 Phoenix is a six legged walking robot. 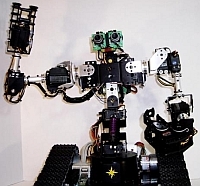 Wait, we know some of you out there may be thinking that hexapod robots are old hat. Well, you’re wrong. So very wrong. Wait until you see it move. Phoenix’s real beauty lies in her graceful motion, which is some of the most convincing and eerily lifelike that we’ve seen in a robot that uses standard hobby servos and a common off-the-shelf servo controller. The kinematics are computed by an intricately programmed spreadsheet, which we highly recommend you check out if you’re a fan of trigonometry. We want to thank everyone for their great submissions. If all goes as planned, the next contest (which is already underway) will conclude at the end of May 2008. You can stay up to date on contest rules and regulations at the Trossen Robotics Project Contest page, and start posting your projects in our Project Showcase Forum. This entry was posted on Tuesday, March 4th, 2008 at 7:35 pm	and is filed under Announcements, Competitions / Contests, Featured Projects / Robots, Front Page News, Fun Stuff. You can follow any responses to this entry through the RSS 2.0 feed. You can leave a response, or trackback from your own site. w00t! Congratz to all the winners. Tough calls made this round, there were so many fantastic entries.